After the completion of the head-to-toe assessment, (See our other article titled, “Assessment of Survivors of Natural Disasters with Non-Life-Threatening Injuries”) the rescuer should begin administering first aid to individuals according to the assessment findings and in alignment with the training they have. CERT trained members receive instruction in the treatment of all the injuries or conditions discovered during the head-to-toe check. During the assessment process when injuries are identified, the rescuer is to document, mentally and later in written format, the injuries that need to be attended to once the assessment is completed. These non-life-threatening injuries include burns, wounds, contusions, sprains, fractures, joint dislocations, hypothermia, dehydration, etc. In this article we will focus on caring for fractures. A fracture is a breaking of a bone. A bone can fracture in different locations, in different ways, can be displaced (deformity) or non-displaced (in alignment), and may break the skin (open or compound fracture) or not break the skin (closed fracture). The type and severity of fracture usually depends on the magnitude of force causing the break. It is stated that the average person suffers two bone fractures during a lifetime. Comminuted fracture: where the bone fractures into multiple pieces of three for more. This type of fracture can result when landing on the legs from a height which produces a longitudinal force in the bone, and it breaks upon itself. Greenstick fracture: this type of fracture usually occurs to a young person whose bones are still somewhat pliable allowing the bone to be bent, with the convexity of the bend fracturing and the concavity side not breaking. Oblique: where the bone breaks in an oblique plane or diagonally. Pathologic fracture: when a fracture is caused by a disease in the bone that has caused it to be weakened or brittle. Spiral fracture: also known as a torsion fracture, occurs as a result of a severe twisting force, such as when the foot is planted and the body is in motion producing a torque force within the bone, often the tibia. Stress fracture: a hairline crack in a bone usually the result of repetitive stress placed overtime, such as jogging long distances. Transverse fracture: usually caused by a direct blow to a bone at a perpendicular angel to its long axis. The break is consequently produced is at a right angle to the long axis of the bone. Stop the bleeding. If dealing with a compound or open fracture with bleeding, stop the bleeding. 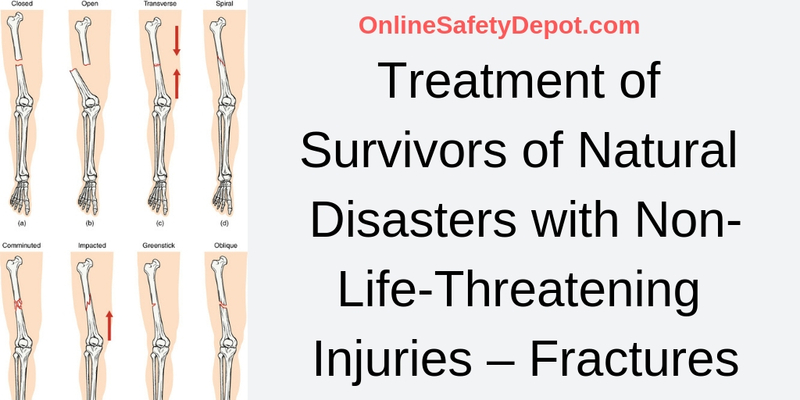 (See our other article titled, “Treatment of Survivors of Natural Disasters with Non-Life-Threatening Injuries – Wounds” for information on how to control bleeding). Note: In the case of an open fracture, do not irrigate the opening as you would a normal wound. Immobilize the injured area. Most sources will instruct to splint the bone in the position found. In other words, do not attempt to realign the bone or push a bone extruding through the skin back inside. Note: If the end of a fractured bone is sticking out of the skin, pace a moist dressing over the bone end to keep it moist and from drying out. Some sources will instruct to use traction to place the displaced “long” bone back into its anatomical position. However, this should usually only be the protocol if in a wilderness setting and a long way (and time) from proper medical care. The splint should be well padded and positioned to immobilize the joints above and below the fracture site. For example, if a person fractured their lower leg (tibia bone), then the splint should be secured to immobilize the knee joint above and the ankle below. If a person fractured their forearm (radius and ulna bones), then the splint should be secured to immobilize the elbow above and the wrist joint below. Also, the splinted arm should then be placed in a sling and swathed to the body to hold it steady. Apply ice packs. Ice is a natural analgesic, or painkiller, and should be placed over the area of the fracture, but not directly to the skin. Place a piece of cloth around the ice pack to protect against a local frost bite or cold reaction. These general guidelines are primarily for treating a fractured bone in the upper and lower limbs. Fractured bones in the head, neck, back, or pelvis present special conditions requiring additional precautions and unique interventions. It’s obvious that moving a victim with a fracture in any of these areas poses additional risk and requires certain techniques to minimize those risks.